I thought it would be important to share some of the rawness of the thought patterns I encounter whilst in a moment of depression. I went from a moment of serious depressive and suicidal thoughts to levelled functional thinking, all within a matter of hours. I am also hopeful the studies within the CTE field continue to learn more about the illness. "Have you seen the movie titled concussion, with award winning actor Will Smith? Smith plays an African Forensic Pathologist who studies the brain & impacts on concussions. CTE is bought on by repeated brain trauma (TBI - Traumatic Brain Injuries) over an extended period of time, with with repeated mild to severe concussions. Although 'Concussion' is just a movie, if you read the above link to studies, you will notice, as I certainly have, the commonalities I have with professional sports that I have played for some 15 years. Although CTE is diagnosed post death, there have been pre death diagnosed athletes, notably NFL & combat sports athletes (MMA & Boxing) in the USA. During the past 2 years I have noticed a considerable increase in the symptoms of CTE in my life - most notably, depression and suicidal ideation. At the age of 32, this scares the hell out of me. Knowing the symptoms and the road CTE could eventually lead to, makes me all the more concerned. The most important thing for me right at this present moment is to continue to raise the awareness and help others on how to live a functioning life with mental illness. By delivering Enemy Within sessions across the globe enables me to do this, and in turn help myself stay well. Right now, I am sitting, waiting for my weather delayed flight to be called in Muscle Shoals, Alabama. Whilst writing this piece I am in deep thought, experiencing extreme paranoia, deep depression, and having suicidal thoughts. Although knowing the concussion film is only a movie, the mind can't help but wonder into the 'what ifs' - what if I end up like a scenes from the concussion movie - retired sportsman, living out've my car, ending in my eventual death and even suicide. 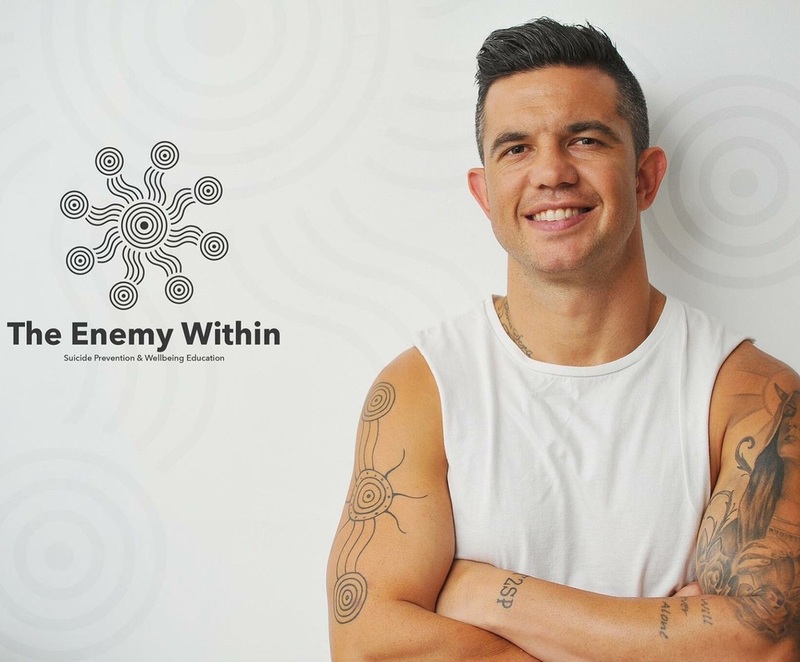 I have promised myself and my loved ones, that I will never die by my own hands - but as I have discussed many times during my Enemy Within Suicide Prevention workshops; I live with constant negative & suicidal thoughts almost on a daily basis, it is often a huge struggle to forge through the day. But the fighter in me, won't let it beat me. As hard as it is, it is part of my wellness plan to write when I am feeling as such as writing helps me to eventually feel better. I am now sitting on the airport runway in a tiny plane, rain and wind outside,again with the negativity bellowing at me with my thoughts. Each breath I know that these thoughts aren't a reality, I grip my hands and breathe in slowly with another one of my coping mechanisms 4, 7, 8 - inhale for 4 seconds, hold for 7 seconds & exhale for 8 seconds.. By doing this, lowers your heart rate & brings you to present. I guess if you are reading this, we landed safely, the mind settled & I'm back in the fight once more. Every single Day, I make that choice, to fight the battle against an enemy that in embedded deep within each thought; thought that continues to tell me I'm no longer worthy to exist on earth - that everyone around me would be in a better place with me not being alive. It Battle Me; It Won't Beat Me"